Students often identify their families as a primary source of career information and support and as this key resource, there are many ways that you can have a positive impact on your student’s career development. Become familiar with the services offered at The University Career Center (UCC), and encourage your student to visit our office early in their academic career. Encourage your student to get involved on campus. Active campus engagement will help your student learn some important things about their skills, preferences and interests and help prepare them for a successful internship or job search. Be an open, receptive sounding board for your student as they are considering various academic majors and exploring possible careers. Ask reflective questions about their interests, strengths and possible next steps. Encourage exploration. Work with your student to identify your relevant colleagues, alumni, friends and relatives to connect with for informational interviews and to expand their network. Does a student’s major determine or limit their career choice? For the most part, a student’s undergraduate major does not dictate their career path, as most majors will help a student develop broad knowledge and skills that can be used in a variety of settings. We suggest that students select a major that interests them. This typically leads to better academic performance and an ability to integrate what they are learning. For any career choice, it will be important for a student to complement their academic major with active campus involvement and leadership, meaningful work or volunteer experiences and internships. Have your student check out our alumni/ae profiles on UCAN to see the many unexpected places our graduates have ended up and how they got there. Do you offer a test to help students figure out what they want to do? We offer a variety of tools to help students narrow in on career options that are consistent with their interests, skills and preferences including the Myers-Briggs Type Indicator (MBTI) CliftonStrengths (CS), and the Strong Interest Inventory (SII). To help students set appropriate expectations for what an assessment can offer, we ask that students schedule an appointment to speak with a career advisor before signing up for a test. They will also be introduced to other services and exercises that can be helpful. Where do Michigan graduates end up? The University Career Center conducts an annual first destination survey to see where our liberal arts graduates have landed. You can see the results of the most recent survey along with law and medical school application statistics on our website. For a more engaging glimpse into the first destination of recent grads, check out our alumni/ae profiles. For information on graduates outside of LSA, please contact those schools/colleges career services directly. When should students start using The University Career Center? To make the most of their Michigan experience, students should begin using The University Career Center as early as freshman year. 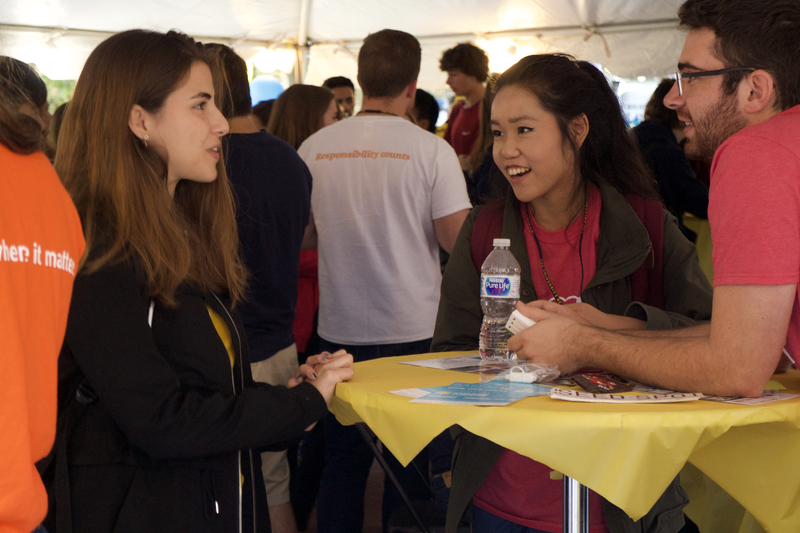 Through our array of initiatives designed exclusively for first-year students, your young wolverine will secure a career coach who can help with choosing a major, exploring career options and planning out and reflecting on meaningful campus activities. They will also gain early exposure to internships and other experiential opportunities designed to help them develop their story and connect with alumni/ae and employers. Do you have the contact information for the other career centers on campus? Your student will have access to any and all resources available here at the University Career Center. Depending on their interests and where they are at in their career development process you are welcome to refer your student to both the University Career Center and their schools and colleges career center. We encourage you to visit Hire Blue to see the other career services office across campus. Can we meet your staff members? Ready. Set. Intern! A workshop designed for first-year students to help set them up to be a GREAT candidate for jobs and internships. From the first year student wondering where to begin to the PhD exploring non-academic options, we’ve got something for everyone. Help your student take full advantage of The University Career Center. Refer them to something specific or just send them our way. Handshake- Find job/internships, on-campus recruiting, employers, career fairs, events, career coaching, and workshops! Make appointments with UCC. Career Coaching and Advising- Support in achieving goals through one-on-one advising and in-depth assistance. Career Tracks- Learn about popular industries through personalized messages which include job postings, resources and relevant events. Career Assessments- Utilize career assessment instruments to help choose an academic major or career, such as Strong Interest Inventory, Cliftonstrengths, or MBTI. Career Guides- Learn about some of the curriculum requirements, as well as skills and abilities that may be developed and applied through each course of study. Immersions- Take a half-day field trip to employer sites to experience a day-in-the-life. See the space. Meet the people. Do the job. Job, Internship and Graduate School Fairs- Meet with recruiters targeting UM-Ann Arbor students and discover new options. Clothes Closet- obtain business casual and business professional attire from a wide selection of clothing for free. Public Service Intern Program (PSIP)- Obtain a summer internship in Washington DC, build career development skills, and live in Washington, DC as part of the PSIP program. Wonder what students from the LSA (Literature Science and the Arts) undergraduate class do after graduation? The University Career Center’s First Destination survey is a snapshot of where this talented group has landed. Check out our First Destination Profile. For information on graduates outside of LSA, please contact those schools/colleges career services directly. What are UM graduates' law school application statistics? University of Michigan continues to have one of the largest pre-law student bodies in the U.S. Take a look at highlights from recent law school application statistics for UM graduates. The information comes from the annual Law School Application Council Pre-Law Advisor Action Report and the National Application Year Summary. What are UM graduates' medical school application statistics? Families of prospective pre-medical students often inquire about the application success rate of University of Michigan graduates. In comparing applicant success rates, families need to remember that the way in which data is presented varies considerably from institution to institution. Some colleges and universities report the success of all their candidates based on anecdotal information; others report on only those who applied through a pre-medical committee; others still, only those that the committee endorsed as a viable candidate. Some may represent the data as the success of the applicant pool for a given year, which includes students who did not graduate from the institution either because they had withdrawn before graduation or because, as graduates of other institutions are enrolled in a post-baccalaureate program. Some may present success rates of students by their year of graduation, while others may represent the data as being for students who applied in a given year. Finally, in reporting numerical profiles, some colleges and universities exclude application profiles for underrepresented students and/or reapplicants. In reporting UM graduates medical school application statistics, The University Career Center utilizes information gathered from the most recent reports from the American Association of Medical Colleges and the American Association of Colleges of Osteopathic Medicine, and includes the application efforts of any UM graduates who wished to apply.